On May 17, 2017, the Honorable Minister Mohammad Nasim, Member of Parliament (MP), Ministry of Health and Family Welfare (MOHFW), officially launched Pharmadex in Bangladesh. Pharamdex (http://pharmadexbd.org/) is a web-based integrated information system that facilitates the submission, review, and evaluation of medicine registration applications and dossiers on the basis of international standards and formats. Minister Mohammed Nasim appreciated the initiative taken by the Directorate General of Drug Administration (DGDA) to digitalize its regulatory systems and congratulated USAID and SIAPS for their system strengthening work with DGDA. The USAID-funded Systems for Improved Access to Pharmaceuticals and Services (SIAPS) Program partnered with the DGDA to improve the efficiency of the country’s medicine registration process. 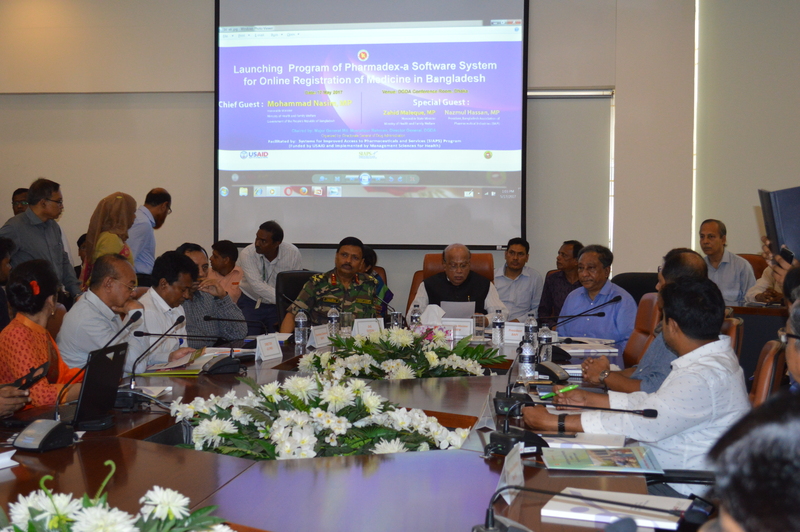 DGDA, with SIAPS technical assistance, adapted Pharmadex to meet the context of Bangladesh to move toward a more efficient and transparent medicine registration system from the current paper-based process. SIAPS facilitated trainings for DGDA officials and selected pharmaceutical industry representatives to build their capacity to use this tool successfully. SIAPS also supported DGDA in adopting Common Technical Document (CTD) guidelines to make sure that the dossiers submitted to DGDA meet international standards. At the event, the Director General of DGDA, Major General Mohammad Mustafizur Rahman, presented the highlights of DGDA’s regulatory activities and said that, although Pharmadex is a new concept for Bangladesh, it can help DGDA ensure that manufactured drugs are safe, effective, and of good quality. The President of the Bangladesh Association of Pharmaceutical Industries (BAPI), Nazmul Hassan, MP, also recognized that a system like Pharmadex, aligned with CTD, is needed for the country. He stressed that pharmaceutical companies would need more training at the initial stage to submit applications online. Miranda Beckman, Deputy Director, Office of Population, Health, Nutrition, and Education, USAID, mentioned that USAID will work shoulder to shoulder to assist DGDA strengthen its capacity on critical regulatory systems and ensure that sustainable health systems exist in Bangladesh. Commending DGDA for taking such a momentous step, SIAPS Bangladesh Country Project Director Zahedul Islam hoped that by using Pharmadex, the DGDA will be able to perform their regulatory functions more efficiently and effectively. A total of 150 participants attended the launch ceremony, including senior officials from the MOHFW, DGDA, and Directorate General of Health Services and representatives of BAPI, the Bangladesh Chemist and Druggist Samity (Association), pharmaceutical manufacturers, USAID, and other international and national organizations, academia, and media.